Before receiving a copy of Dearga, this reviewer would have been completely stumped if asked who Matt and Shannon Heaton were and, in this particular case, the ignorance would have been by no means blissful. Indeed, since the CD arrived without any accompanying PR, to some extent I am little the wiser. All that can be gleaned from the well-designed gatefold cover is that the pair are based in Boston, Massachusetts, that Shannon is a mean flute and whistle player while Matt provides excellent accompaniment on guitars (acoustic and electric), dobro and bodhrán and both sing. 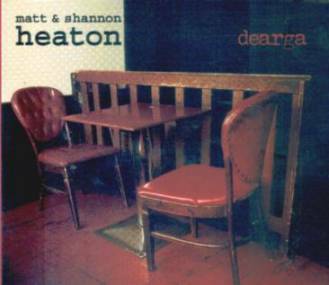 For the most part, Dearga sees Shannon and Matt working as a duo and, while they’re clearly well-grounded in the music, they’re also keen to explore its dimensions. This becomes immediately apparent on the opening track where the very familiar reel My Love is in America segues effortlessly into one of Shannon’s own compositions, Alternate Routes. She’s clearly well aware good links throughout the album, meshing Junior Crehan’s reworking of Mist Covered Mountain as a jig with the more widely known Tell Her I Am and Maurice Lennon’s Road to Garrison with Maids of Mitchelstown. Indeed, it’s Shannon’s mellifluous flute which dominates much of the proceedings, though Matt appears to be one of those accompanists who knows exactly which notes to play and when not to play them! His guitar work is subtlety incarnate and his own composition, Lemony Lullaby, offers clear indications of his own compositional talents. The three songs on the album include a fetching Fair Jamie from Shannon, though the couple’s version of Keeper of the Game is less successful. Despite that Dearga is still a highly enjoyable release.